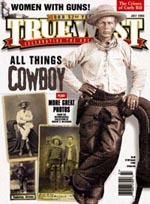 True West Magazine (alternate title: True West) is an American magazine that covers the icons like Wyatt Earp, Doc Holliday, Billy the Kid, and Jesse James and relates American Old West history back to the present day to show the role contemporary Western heritage plays in keeping the spirit of the Old West alive today. Started in 1953, True West is headquartered in Cave Creek, Arizona, and publishes monthly. It is the world's oldest, continuously-published Western American magazine. True West observed its 65th anniversary in 2018, having offered past coverage in Blasts from the Past, beginning in its January 2013 issue. True West began publication in 1953 under founder Joe Small of Austin, Texas. The idea for True West originated from a monthly feature in Small's first publication, Sporting Magazine. The magazine's recurring "Bad Man" article, about outlaws of the West, was the feature that generated the most reader mail and interest. True West was born to satisfy the readers' hunger for Old West history. True West was the largest Western magazine on the market in the 1960s, selling hundreds of thousands of copies monthly at newsstands. The magazine benefited from an era featuring popular television western series such as Bonanza, The Lone Ranger, and Gunsmoke. At least one episode, "The Hunted" (1958), of the ABC/Warner Brothers series Sugarfoot is based on a True West article. Fans interested in the lives of real cowboys and cowgirls found those stories in True West. After that, the early era of television westerns faded during the time of the Vietnam War and disco music. In 1979, Small sold the magazine to Chet Krause of Iola, Wisconsin. Small stayed on as publisher, with Krause as assistant publisher. The magazine saw a few moves — to Perkins, Oklahoma, then Stillwater — before the 1999 move to Cave Creek, Arizona. Among its new owners was Bob Boze Bell, who first discovered the magazine as a nine-year-old at Desert Drugs in Kingman, Arizona. The publication sparked a lifelong interest in the Old West. As the January 2000 issue was being edited, Bell flew to Stillwater to design the cover because he, "wanted to own the millennium." Bell felt the magazine needed to change with the times or it would not survive. One of the first changes he made was switching the magazine from pulp paper to gloss, as True West was one of the last remaining publications using pulp. He also expanded the coverage of Western movies, since so many people developed a love of Old West history after being exposed to Westerns on television or the big screen. He added, and still writes, the successful "Classic Gunfights" department that has featured more than one hundred gunfights of the Old West. In 2007, Ken Amorosano joined the team as associate publisher. In 2011, he became True West's publisher and set the magazine in a new direction, catering the publication more toward its core history aficionados and expanding the magazine's readership globally. To put forth their vision, Bell and Amorosano rely on a quality editorial and production team headed by editor-in-chief Bob Boze Bell, art director Daniel Harshberger, production manager Robert Ray, and general manager Carol Compton Glenn. The magazine has continued to change with the times. Readers mingle on True West's regularly updated social network feeds: Facebook, Pinterest, YouTube and Twitter. True West puts the focus on history with features like "Classic Gunfights" and "Ask the Marshall", featuring Arizona's official state historian Marshall Trimble, who responds to reader inquiries such as, "How prevalent was the stampede string on Old West hats?" Firearms expert Phil Spangenberger features a classic Western firearm each month in "Shooting from the Hip". The magazine also shines the spotlight on today's true Westerners with the departments "What History Has Taught Me" and "'Old West Saviors". Investigating History delves into questions of the past to bring readers answers to long-held mysteries. True West guides readers who still want to experience and live an Old West lifestyle by publishing features such as its hearty food column, "Frontier Fare", and "Evolution of Western Wear", sharing the history behind the clothing and gear worn by Westerners today. "True Western Towns" guides readers to cities where the West is still alive. "Renegade Roads" creates history-inspired travel routes for readers to embark to the West. Executive editor Bob Boze Bell is regularly featured on True West Moments, which airs on Encore's Westerns channel. He responds to inquiries from around the world. In 2012, in honor of Arizona's centennial, True West created and released the show Outrageous Arizona, an irreverent and humorous look at the history of Arizona, hosted by Bob Boze Bell and True West contributors Jana Bommersbach and Marshall Trimble. The show aired on select PBS stations in the Southwest. Outrageous Arizona received an EMMY Award from Rocky Mountain Southwest Chapter of the National Academy of Television Arts and Sciences (NATAS) in 2013. True West has won multiple silver and bronze All-Industry Marketing (AIM) awards since 2005. In 2008, the Western Writers of America awarded True West the Lariat Award for outstanding support of the organization and its members. In June 2010, True West hit Fern Siegel's "Magazine Rack" in Media Post. "The Empire State Building is my true north—as it is for anyone who lives in downtown Manhattan... For those seeking an authentic experience without actual contact, try True West," Siegel wrote, adding: "Today, the popular history pub hopes to 'capture the spirit of the West with authenticity, personality and humor,' linking its past to its present. In the immortal words of Seinfeld's Kramer: 'Giddy-up.'" The Oregon-California Trails Association awarded True West the Distinguished Service Award in August 2010 in recognition of consistently publishing travel articles on the National Historic Trails. An Oregon city, The Dalles, recognized True West as a top national magazine in January 2011. ^ "The First Sixty Years of True West Magazine". True West Magazine. Retrieved 2012-12-10. ^ "Classic Gunfights". True West Magazine. Retrieved 2007-01-01. ^ "'Outrageous Arizona' stories captured in new Eight show". ASU News. Retrieved 2012-08-06. ^ "Outrageous Arizona DVD". True West Magazine. Retrieved 2012-08-06. ^ "Eight, Arizona PBS shines at 2013 Rocky Mountain Emmy Gala, winning four Emmy Awards | Arizona PBS". Arizona PBS. Retrieved 2018-10-13. ^ "Magazine Rack: True West". Media Post. Retrieved 2010-06-09. Abram Henson Meadows (March 10, 1860 – December 9, 1932), also known as Charlie Meadows and Arizona Charlie, was an American showman and sharpshooter, and a contemporary of "Buffalo Bill" Cody whose Wild West Show inspired Meadows to pursue his own performing career. Meadows was born on March 10, 1859 along Elbow Creek near modern-day Visalia, California, the 6th of 12 children of John Meadows Sr. After Abraham Lincoln became president, his father changed his name to Charles, moving the family to a ranch in Diamond Valley north of Payson, Arizona. On July 15, 1882 John Meadows Sr. was killed by a party of Cibecue Apaches led by Natiotish, who killed his elder brother Henry, leaving him the man of the house. In 1884 Charlie and John C. Chilson organized the Payson Rodeo, which claims to be America's first continuous rodeo. Meadows died on December 9, 1932 in Yuma, Arizona, at the age of 73. Cimarron Firearms is an American firearms importer that has been in operation since 1984. The company's field of specialty is reproduction firearms from the American Civil War to the end of the Old West period. Founded by Mike Harvey in Houston, Texas, the company is now based in Fredericksburg, Texas.Cimarron produces firearms within the industry of western reproduction arms. The firearms are manufactured to their specifications by Uberti and Davide Pedersoli in Brescia, Italy. Uberti makes their revolvers, lever action rifles as well as the 1885 single shot falling block rifle, and shotguns. Pedersoli makes rolling block and falling block single shot rifles to their specifications. In 2011 Cimarron contracted Armscor to manufacture a pre-World War 2 pattern 1911 semiautomatic pistol to their specifications.Because of the attention to detail given their firearms, Cimarron's revolvers and rifles have been used by weapons masters in a number of Western Films. Additionally, Cimarron markets several of these firearms to collectors in addition to reenactors and competitive shooters. Many of the company's designs have won awards from True West Magazine's "Best of the West". Concordia Cemetery is a burial ground in El Paso, Texas. It is well known for the being the burial place of several gunslingers and old west lawmen. The first burial took place in 1856. There are between 60,000 and 65,000 graves in the cemetery. Concordia is the only place to have a Chinese cemetery in Texas. Doug Engebretson is an American author and historian. His best-known work is "Empty Saddles, Forgotten Names: Outlaws of the Black Hills and Wyoming" (1982), which includes accounts of early-day outlaws operating in Wyoming and the neighboring Black Hills of South Dakota. Engebretson also published an article entitled "The Spearfish Mail Stage Holdup" which appeared in 'True West Magazine' August, 1987. Volume 34, No. 8., Published by Western Publications. Frederick William Nolan (born 7 March 1931 in Liverpool is an English editor and writer, mostly known as Frederick Nolan; he also uses the pen names Donald Severn, Daniel Rockfern, Christine McGuire, and Frederick H. Christian. George Coe (1856–1941) was an Old West cowboy and a gunman during the Lincoln County War. Honkytonk Sue: The Queen of Western Swing is a comic character which first appeared in National Lampoon in 1977. It was created by Bob Boze Bell. Honkytonk Sue later appeared as a weekly comic strip in the Phoenix New Times from 1978 to 1980. Four comic books culled from these weekly strips were self-published by Bell, the first being published in 1978 and the fourth in 1980. The character was optioned by Columbia Pictures in 1983, and Larry McMurtry, among others, worked on scripts (four were created over a two-year period) for a Goldie Hawn vehicle, that was never made. Honkytonk Sue had a revival on the pages of True West Magazine in 2002 and ran for several years. The Internet Movie Firearms Database (IMFDb) is an online database of firearms used or featured in films, television shows, video games, and anime. A wiki running the MediaWiki software, it is similar in function (although unaffiliated) to the Internet Movie Database for the entertainment industry. It includes articles relating to actors, and some characters, such as James Bond, listing the particular firearms they have been associated with in their movies. Integrated into the website is an image hosting section similar to Wikimedia Commons that includes firearm photos, manufacturer logos, screenshots and related art. The site has been cited in magazines such as the NRA's American Rifleman and True West Magazine and magazine format television shows such as Shooting USA on the Outdoor Channel. Juni Fisher (born c. 1956) is a western and folk singer-songwriter. She has received ten awards from the Western Music Association: the Crescendo Award (2005), Female Performer of the Year (2006, 2009, 2011), Song of the Year (2007, 2011, 2013), Songwriter of the Year (2008) and Album of the Year (2009)and Entertainer of the Year (2011). In addition, the Academy of Western Artists named her Female Performer of the Year in 2005. The National Cowboy Museum awarded Fisher with the coveted Western Heritage "Wrangler Award" in 2009 for Most Outstanding Western Album, making her the first female recipient of that award in the history of the National Cowboy Museum's awards. True West Magazine named her the Most Outstanding Solo Artist of 2012. She was awarded the Western Writers of America Song of the Year in 2014 award for a song she co-wrote with Cowboy Poet Waddie Mitchell. KSLX-FM is a Classic rock radio station serving the Phoenix, Arizona area. The Hubbard Broadcasting, Inc. outlet broadcasts at 100.7 MHz with an ERP of 100 kW and is licensed to Scottsdale, Arizona. KSLX simulcasts in digital HD Radio. Its studios are located on North 52nd Street west of Papago Park and its transmitter is in South Mountain Park. Morgan Seth Earp (April 24, 1851 – March 18, 1882) was a Tombstone, Arizona Special Policeman when he helped his brothers Virgil and Wyatt and Doc Holliday confront the outlaw Cochise County Cowboys in the Gunfight at the O.K. Corral on October 26, 1881. All three Earp brothers had been the target of repeated death threats made by the Cowboys who were upset by the Earps' interference in their illegal activities. The lawmen killed Cowboys Tom and Frank McLaury and Billy Clanton. All four lawmen were charged with murder by Billy's older brother, Ike Clanton, who had run from the gunfight. During a month-long preliminary hearing, Judge Wells Spicer exonerated the men, concluding they had been performing their duty. Friends of the slain outlaws retaliated, and on December 29, Cowboys ambushed Virgil, leaving him maimed. Two and a half months later, on March 18, 1882, they ambushed Morgan, shooting him at night through the window of a door while he was playing billiards and killed him. The Cowboys suspected in both shootings were let off on technicalities or lack of evidence. Wyatt Earp felt he could not rely on the criminal justice system and decided to take matters into his own hands. He concluded the only way to get justice for his murdered brother was to avenge his death. Wyatt assembled a posse that included their brother Warren Earp and set out on a vendetta to kill those they felt were responsible. Morgan married Louisa Alice Houston sometime in the 1870s. They lived in Montana before joining his brothers in Tombstone. Louisa was staying with his parents in California when Morgan was murdered. The Patee House, also known as Patee House Museum, was completed in 1858 as a 140-room luxury hotel at 12th Street and Penn in St. Joseph, Missouri. It was one of the best-known hotels west of the Mississippi River.The Patee House was built by John Patée as part of his Patee Town development around the Hannibal and St. Joseph Railroad station. Office space included the headquarters and eastern terminus of the Pony Express, founded in 1860 to provide fast overland mail service to the West Coast. During the American Civil War, the Union Army Provost Marshal's office was located in Patee House. The Army conducted war trials in the second floor ballroom. After the war, the Patee Female College operated in the building from 1865-1868. Its space was taken over 1875-1880 by the St. Joseph Female College, founded in affiliation with the Baptist Church. These private schools were part of the postwar expansion of educational facilities for young women across the country. After outlaw Jesse James was killed in 1882 at his nearby home, his surviving family stayed at the hotel during the investigation of his death. It was then called World's Hotel. Also resident at the hotel within two weeks of James' death was Oscar Wilde who lectured in St. Joseph on April 18, 1882. Later the building was adapted to house the R.L. McDonald shirt factory and other light industrial uses for 80 years. Since 1963, the building has been operated as a museum of United States history, with an emphasis on transportation. An 1892 Hannibal and St. Joseph Railroad steam locomotive and 1877 railroad depot are displayed inside the building. In 2008 the museum was selected as one of "America's Top Ten Western Museums" by True West Magazine. It was also listed in 1,000 Places to See in the USA and Canada Before You Die. The building was designated a National Historic Landmark for its role as the Pony Express headquarters. It marks the eastern terminus of the Pony Express National Historic Trail. The Jesse James Home Museum is located on Patee House grounds. Both are owned and operated by the Pony Express Historical Association, a not-for-profit organization. Both are contributing resources to the Patee Town Historic District. Rose Elizabeth Dunn (September 5, 1878 – June 11, 1955), also known as Rose of Cimarron and later Rose of the Cimarron, was best known for her good looks and for her romantic involvement with outlaw George "Bittercreek" Newcomb when she was a teenager during the closing years of the Old West. The Tucson Museum of Art and Historic Block (TMA) is an art museum and art education institution located in the Presidio District of downtown Tucson, Arizona. The museum comprises 74,000-square-feet of exhibition space over a four-acre city block that includes a contemporary main museum and 19th C. historic homes that have been adapted for reuse as the Museum restaurant, pottery school, and galleries. The Museum concurrently presents eight to nine exhibitions including international and traveling exhibitions, TMA-curated exhibitions, and ongoing exhibitions of permanent collections. TMA's collection of more than 8,000 objects is focused on modern and contemporary art, Latin American, Western and Native American, and Asian art. The Museum has served as a community art education venue since its inception in 1924. Art education has continued as a major function of the Museum through museum staff and a docent organization that carries out education and outreach programs. The Museum's campus of landscaped plazas host community and private events including artisans markets, festivals, live performances, an annual Día de los Muertos event, weddings, high school proms, award ceremonies, and other community events. The Museum hosts Creative Space, an interactive space for children and families. The Museum campus includes Cafe a la C'Art, a full service restaurant and bakery that was ranked one of the top museum restaurants in the United States by Food & Wine Magazine. and the Museum Store, featuring original art and craft work by local and regional artists and artisans. In 2015, the Tucson Museum of Art was named one of the Top Western Art Museums in the United States by True West magazine.